Twins. Brothers. The same. But different. Julian Daniel Freyer and Joshua David Freyer have the same initials (JDF like their daddy! ), and their middle names are in honor of their grandfathers. Both have dimples (like their mama!). Both are big for their age. Julian was smaller than Joshua for a while. Now they are close in weight but have different builds. Both have fair completions (Our family keeps the sunscreen industry in business! ), but their skin tones are different. Julian has hazel eyes and Joshua has blue. The most striking different in appearance is their hair. Both boys are curious and love to explore. They crawl very fast! They are full awe and wonder and are quick to laugh at the littlest things (and each other). They like to splish splash in the bathtub (and the dogs' water bowls). They love music and will stop what they're doing if music comes on the television. Julian currently enjoys shaking his head and clapping his hands. Joshua likes to wave and run his finger over his lips to make funny sounds. They are both chatter boxes and can be impressively loud at times. They enjoy going for walks and alternate between sitting and watching the scenery, falling asleep, and trying to get out of the stroller. 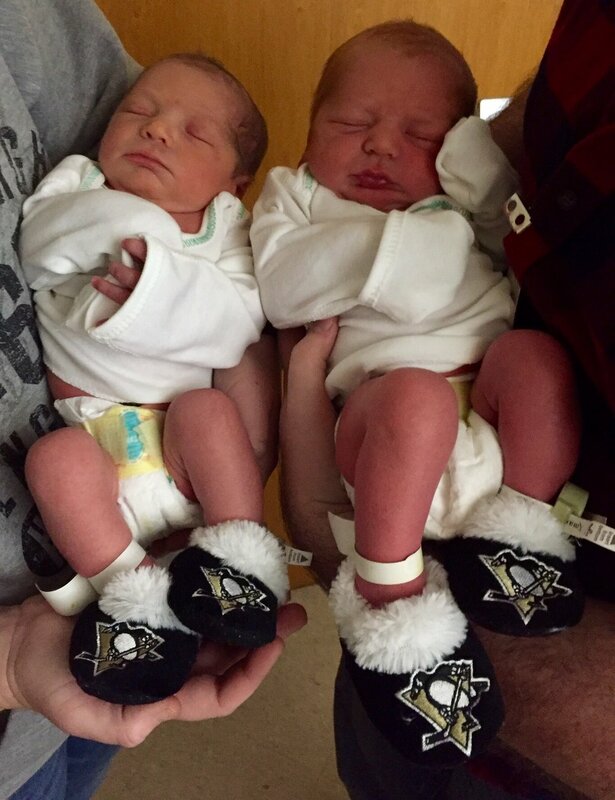 And of course, having been born into the Freyer family, they are already lifelong Pittsburgh Penguins fans.